Tired of wearing last season's red-and-black metal shirts? Bored with black-and-purple? Not feeling the monochromatic grey-on-black vibe? We hear ya! 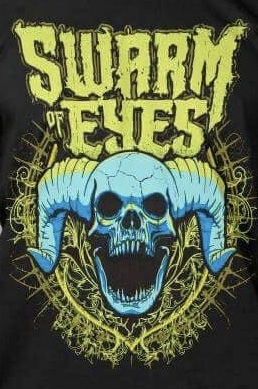 Step up your metal t-shirt game with Swarm of Eyes' newest mean green (and blue) horned skull graphic tee. Printed on premium cotton, this fitted ladies' t-shirt will have you "swarmed" with compliments as you "enter the circle" and smash the patriarchy in the pit. Oh. Hell. Yes.